Vacation rental house. Sleeps 3, 0 bedroom, 0 bathroom. No pets allowed. Spacious room with large king bed and love seat. There is a trundle bed for additional sleepers. The bottom pulls out and between the top and bottom mattress makes two twin beds. Bathroom only. Shower located in the main house. Cute and cozy cottage with own path to upper yard and parking. Right outside is the ping pong table. 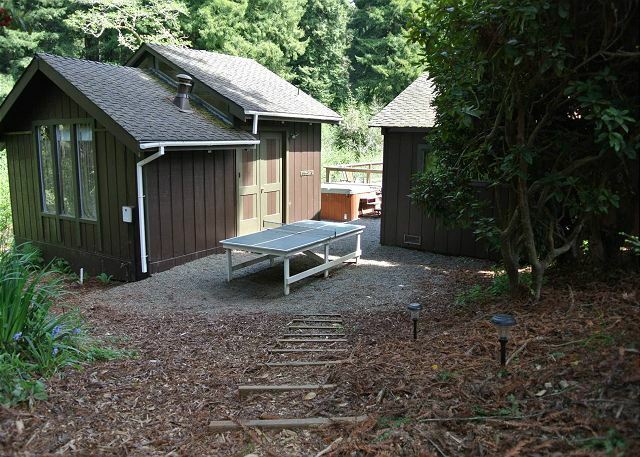 The cottage is adjacent to the hot tub and trails. Close to the fire pit. There is a trail leading right up to a nice cozy spot under the trees. Enjoy some bonding time with nature by exploring the trails we have maintained for you. Be sure to have your camera ready for any photographs you may want to take along the way. 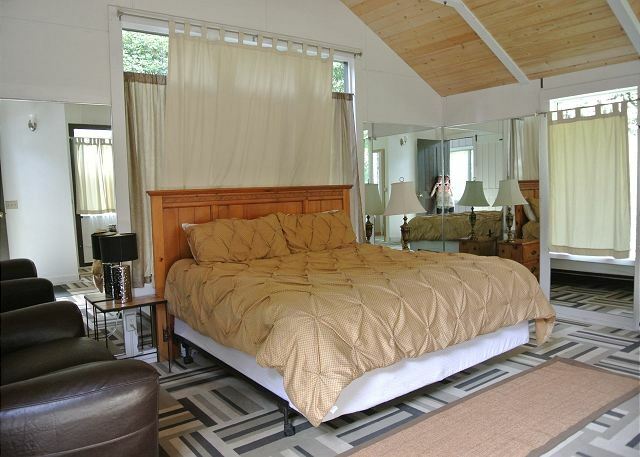 This cottage may not be rented independently, only as an addition to the main house Paloma Creek Lodge. Thank you for the great review, Josh! We enjoyed having you and we are so glad the home was a good fit for you and your family. This home is perfect for 5 adults and 5 kids. It is spacious, has a game room, large deck, and is walking distance to much of town. We hope you will return to visit us again soon. We had a great time in this rental. The house was in a beautiful setting with a lot of privacy. It was clean and the management was very helpful. I would definitely stay here again! The beach was really close. You could walk there easily. The store was also a short walk away. Paloma Lodge is a great place for families to stay while visiting our area. Not only does it have the feel of privacy, it is close to the beach and walking distance to much of Trinidad. We are glad you had a great time and we hope this means you will return to visit us again soon! 2nd Stay Here - Love it! This was our second time renting Paloma Lodge and our third rental with Redwood Coast. The house is large and comfortable, the game room is a huge plus, and it is perfectly situated on a quiet (if bumpy road) that feels like it is away from everything but is close to everything. Walk a few minutes one direction, and you have the wonderful Murphy's Market for groceries. A few minutes the other direction, and you are at Indian Beach. One alert to other folks who have rented here before and are returning: We stayed in the house last spring and used all the available beds including a sofa bed. We reserved our next stay for the following year planning to use all beds again. Just by luck, I happen to see the new drone video they published of the house a couple of months before our next stay and noticed the sofa bed was gone in the video although it was still visible in photos of the place and in some descriptions. I wish folks who had reserved the place prior to the sofa bed's removal were warned once it was removed that the bed would not be available. If we had arrived to find it gone, we would have been VERY upset. As I just happened to find out on my own soon before our trip, we did not have enough time to reschedule another rental and had no choice but to add on the additional unit on the property at an additional cost which made our trip much more costly than we had planned and budgeted. The extra unit was a good size and has great views, but the bed in that room was hard and the most uncomfortable bed I've slept on in many years. I'm still giving this house a great rating because it is in fact a wonderful rental, but now that the sofa bed is gone in the main house, our family will explore other options for our next trip. 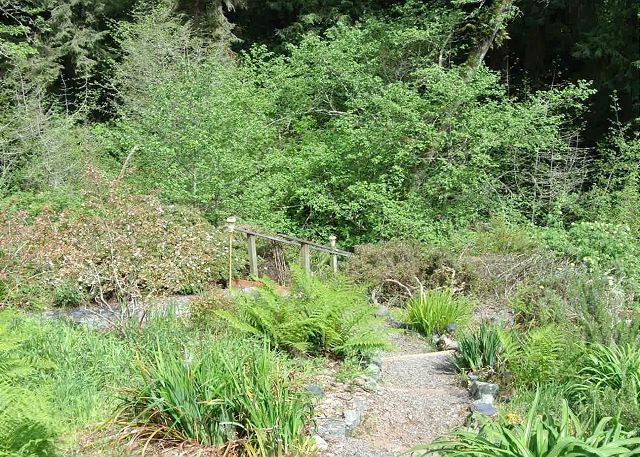 Thank you for being a return guest, not only to the Paloma Creek Lodge, but to Redwood Coast Vacation Rentals. Happy to hear you enjoyed your stay at the home. This is one of our most popular home for large, quiet, families visiting our area. Our homes do change frequently, not only due to wear and tear and updating, but in 2017 there were changes to City Ordinances, restricting the number of occupants to two per bedroom, and since that isn't a separate bedroom, we were able to make better use of the space by converting it to a sitting room. Removing the sleeper also helps prevent guests from trying to sneak in additional occupants. The cottage is a very nice add-on, as it provides some privacy for guests, and is quite inexpensive. The bed is fairly new, and we are sorry you found it uncomfortable. We will definitely look into this. Whether this home or another, we do hope you will return to visit our lovely area again. Thank you for your recent stay. Our family was right at home. The first day it looked like we had moved in. The kids loved being able to go explore all the things around. So nice that the stores are a short walk away. I love hearing when guests say they felt right at home. This is the perfect home for a family to relax and explore; so glad you had a great time. Thank you for choosing the Paloma Creek Lodge and for booking with Redwood Coast Vacation Rentals. Lots of room, great game room. Operation of TV in living room confusing.. Very good locatin. House was clean. Manager was very accommodating and helpful. Stairway dark and lights needed. Thank you for your addition of the Paloma Lodge Cottage. It is always nice to be able to add on some extended room while vacationing with family. This property does provide a lot of room and the game room is a bonus. Thank you for your feedback of the TV in the living room; I will look at the instructions provided and see if I can make them a little clearer. this feedback is much appreciated, as we want every guest to have ease during their stay. Thank you for booking with Redwood Coast Vacation Rentals and I hope you will return to visit us again for another family vacation. Beautiful location! The home was spacious enough for extended family to enjoy a week together without feeling to cramped. The game room was a hit! So glad to hear that the Paloma Lodge was such a hit! The game room is an added bonus for sure! Thank you for booking with Redwood Coast Vacation Rentals. I hope you and your family will return to visit us again! We really enjoyed getting together at the Paloma lodge. It was big enough to accommodate everyone and the hot tub and game room were great. The only reason I didn't give it a higher rating was because the walk to the beach on the trail is a little hard for anyone that has trouble walking. Nice trail just a little steep but the lodge is close enough to the other more accessible beaches so it worked out fine. The TV in the cottage house and smaller bedroom didn't work but other than those few things all turned out great. Nice and private. Thank you for letting me know about the tv's in the Paloma Creek Lodge. No one has mentioned it at all, so I will have them checked out as soon as I can get in. Otherwise, I am pleased you had a nice stay. This cottage was very beneficial to our large group. It was bright, cheerful and very clean. Half bath attached was a plus. Surrounded by redwoods! Thank you for your stay at the Paloma Creek Lodge and Cottage. Please visit us again! We continue to enjoy our stays, year afer year, at the Paloma Lodge and Cottage. There are continued improves made on the facility. I think the place is perfect for our large group of adults and youth. The property is clean well maintained and the everyone from Heather ( reservations) to Dori( mailing us idems that were left at the lodge) were very helpfull. We are so happy to have you return to the Paloma Creek Lodge and to Redwood Coast Vacation Rentals. Thank you for noticing the improvements, your feedback means a a lot to us. I hope this means we will see you again next year! We look forward to your return and wish you well until then. Thank you from all of us at RCVR. Stayed here for HSU graduation weekend. Perfect accommodations for our family and friends of 11. With all the excitement of graduation, was great to have a place to relax and enjoy before and after. The deck was a great gathering for early morning, peaceful. Easy walk to the beach. Friendly neighbors. Only suggestion, to clean the path ways down to the seating areas, starting to appear overgrown and would be more appealing in appearance. Cottage a bit dated with decor, and musty smell - was an easy fix with opening the window. Thanks for a great location to enjoy a special weekend. Everyone would come back to stay. What a great house for graduation weekend! I am so glad it accommodated your family and friends so well. Yes, I did see the path was a bit overgrown; everything has been growing faster than I can keep up, but we are on it right away. Despite graduation has come and gone, we would love to have you stay with us again for whatever occasion presents itself next :) Once again, thank you from Redwood Coast Vacation Rentals. Thank you, Sonny, for staying at our homes. The Paloma Cottage is a great addition to the Paloma Creek Lodge for those extra guests. 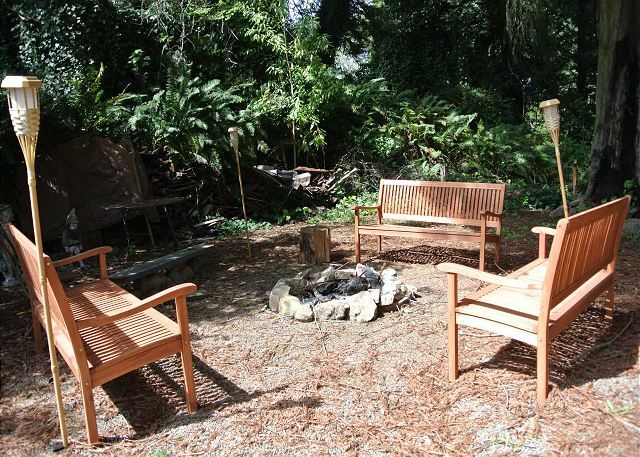 Redwood Coast Vacation Rentals appreciates your stay and hopes you will return to us again. Thank you for your business! The house was perfect for our meeting of directors from all over California - ample, clean, warm and close to everything in town. We walked into town to lunch each day and to sightsee - wonderful. Thank you for the review of Paloma Lodge. I am please to hear that the house worked great for you. It is a unique house, perfect for larger groups, with great walking access to the beaches and town. I do hope you will return to have another retreat there again in the future. This house was perfect for our family's recent gathering to celebrate our parents' 50th wedding anniversary. Lots of room to spread out, game room a hit with the kids, great hikes and gorgeous weather! A fun weekend made even better by a beautiful location and awesome house! Sounds like you had a great 50th Anniversary Celebration at the Paloma Creek Lodge. We hope you will be able to return for many more. Imagine 2 grandparents, 4 parents, 5 children 8 to 12 in a spacious, comfortable house with plenty of room for everyone. That's Paloma Creek Lodge in Trinidad. Thank you fro your stay. I am pleased that the Paloma cottage addition was able to provide you with the additional space for your family. I do home you will be able to visit us again. This was our fourth year of staying at the Paloma Lodge. The home is perfect for our needs. There is plenty of space for everyone's activities, adults and youth alike.Thank you for another amazing stay! Thank you for returning to the Paloma Creek Lodge, we love having you here! Overall we had a great time. There were some things in the kitchen that would have made the stay more convenient. There needs to be more dish towels, oven mitts and food storage containers and kitchen trash bags. Also, the dryer was broken. I am glad you had a great time at the Paloma Creek Lodge. We appreciate your suggestions and have made some to addition to the home where needed. The dryer is also being addressed. I am pleased you had a lovely time here. It is really a unique house in such a beautiful environment and very conveniently located. Please visit us again.